New Delhi: For the past decade, Reena Nath has been watching the Indian family go through a series of subtle metamorphoses. 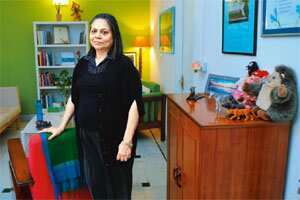 Working as a therapist in Delhi for 30 years, and specializing in family therapy for 10, has given Nath a window into the minds of Indian families as they negotiate changing family roles, domestic dramas and psychological upheavals. Transition phase: Reena Nath says there is an urgent need for intervention in villages, where people, unlike their urban counterparts, are still reluctant to talk to professionals about family matters. Photo: Priyanka Parashar/Mint. Nath’s office in Saket, full of books and polished wood, pebbles in bowls, earthenware and contemporary postcards, is redolent of her catholic taste; on the wall is a Mark Rothko print. Academic texts on psychology and therapy sit alongside a copy of Grimms’ Fairy Tales and Alain de Botton’s Essays in Love. But though she has studied in London and learnt Western techniques and principles, Nath is primarily interested in how to apply these practises to a growing client base: the Indian family. “It’s phenomenal—the kind of cases I’m seeing now compared with the early ’90s," says Nath, whose voice is surprisingly deep and who speaks in the steady, measured sentences of an experienced practitioner. “I really think that the changes have happened since 1998 or 1999. The number of people coming for therapy has increased and it hasn’t stopped." Therapy or counselling in India is no longer regarded as the last resort of the mentally ill, says Nath, but is now increasingly viewed as a useful and even necessary option. A society that has traditionally kept its problems private is gradually giving way, especially in the cities, to one that will pay for professional help. “The kind of trust and knowledge and information share that would happen in a family that lived cheek-by-jowl with each other is no longer prevalent," says Nath of the nuclear families that live in cities. “Now I see adult children who have conflicts, parents who might be disappointed with their children, particularly with grown-up daughters, who are either divorced or unmarried. It’s a very new situation for the Indian family to cope with." “I think that underneath that there are very major issues of the family in transition," Nath says. That isn’t to say that the rural population is without problems. In fact, says Nath, “the need for intervention is desperate in the villages. There’s a lot of drug use, falling in love, being trained for a profession but not being able to jump on the globalization bandwagon through lack of education". Unlike their urban counterparts, rural families have not lost their reluctance to talk to professionals about family matters. As so-called “Western" attitudes become prevalent, so too do “Western" problems. “When I worked in London in 1999, I wasn’t particularly interested in eating disorders or self-harming because those cases didn’t come into the clinics in India. You wouldn’t see them outside the hospital setting," says Nath. “But the moment I got back here, the first two clients I saw had these problems. They were young people, adolescents, and I discovered that (self-harming) was endemic." Nath still sees many cases of self-harming and cutting; teenage boys as well as girls are brought for therapy on account of it by worried parents. “I think they are puzzled by it," says Nath, “and quite bewildered. They still don’t see eating disorders and the like as psychological disorders, it’s easier to name it ‘stubbornness’ still." Nath’s observations might seem gloomy, but she is serene about the future, saying that she notices particularly strong and tenacious inter-generational ties among Indian families that aren’t going away. “The family’s not dying anywhere; it might be a different kind of family, it might be a ‘reconstituted family’ as they call it—the new family. It may not be the ideal that was touted in the ’50s and the ’60s, but I don’t see the family ending in any way," she says. Nath suggests that the new interest in family therapy reflects a struggle on the part of Indians to get to grips with a changing set of rules, and that is something she thinks will not be a problem in the long run. “One of the strengths I find particularly with Indian families is their adaptability," she says, “and you see that happening in big and small ways". The answer, she thinks, does not lie in the blanket adoption of Western methods of therapy any more than Indians discarding traditional medicines or diet. There are inherent cultural differences between Indians and Americans or Europeans. “We don’t just apply ideas developed in the West," she says. “For example, it’s a very Western idea that we should all talk to each other about our problems, but a lot of people in India believe that sharing doesn’t have to be spoken in words. ‘What is there to say?’ they might ask. ‘You can see and understand a problem without speaking also.’ We call it mindfulness. In India, we have our own voice and we have incredible power."